AROUND THE CORNER, 30" scapes, 5 1/2" flower, dormant, midseason, 5 way branching, 25 buds, tetraploid. 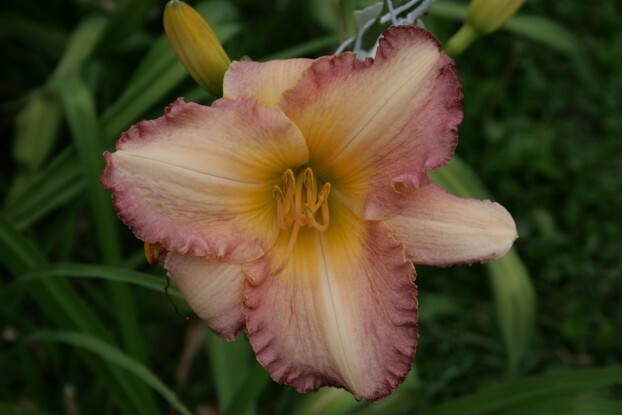 ((SPANISH GLOW X HEAVENLY TREASURE) X SIBERIAN SUMMER). The first of our edge without eye introductions. A wonderful flower with dark rose edging on both the petals and sepals. AROUND THE CORNER does not come from diploid conversions like many recent edge without eye introductions. Rather, it is the result of selecting tetraploid parents with the potential for producing the desired result. Widely spaced branching, excellent bud count, and zone 5 hardiness round things out. Fertile both ways. $20 DF. Web site and all images copywrite © Peter Mondron. Use of images prohibited without written permission. All rights reserved.